Although they were discovered nearly 30 years ago, exosomes have only recently moved into the research spotlight. Now, biomedical researchers are examining the contents and characteristics of exosomes as possible biomarkers for cancer and other diseases because they can be sampled non-invasively. Biologists are uncovering a diversity of functional changes elicited in cells upon taking up exosomes via membrane fusion or ligand-receptor interactions. Previously believed to be no more than garbage disposal systems of the cell, evidence is rapidly accumulating to the role of exosomes as messengers conveying information between cells. As small membrane vesicles released by endocytosis, exosomes carry proteins, lipids, miRNA and mRNA specific to the type of cell from which they originate, be it T cells, B cells, dendritic cells, platelets, neurons, or epithelial cells. They transport this payload as they travel in biological fluids to distant tissues. Due to their small size (≤150 nm), capturing and examining exosomes has proven challenging. Detection of single exosomes is very difficult via flow cytometry, but it is possible to gain insights about a population of exosomes. Proteins on the surface of exosomes can be stained with fluorochrome-conjugated antibodies to characterize populations originating from a particular cell type. Then run your samples on the flow cytometer and use gating to isolate the data from the stained exosome clusters. Need a detailed protocol? Want to see an example gating strategy? 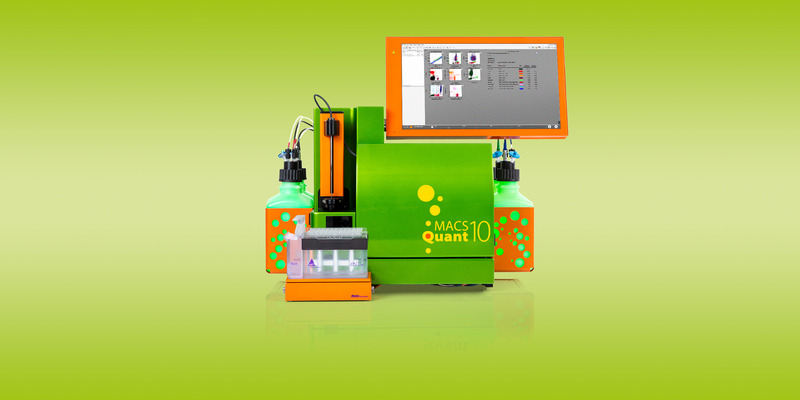 Read our Application Note “Characterization of exosome populations using the MACSQuant Analyzer.” If you have further questions, we can help.